Product Recycling as applied to the car. Objectives of book.II. Metal and Material Ecology. A description of the metal cycles. A prescription for the metal cycles. Electronics recycling: Lead free solder. Synthesis and conclusions.III. Product Recycling as Applied to the Car. The dynamic and distributed nature of the recycling rate of the car - a fundamental description of recycling systems. Dynamic modelling and optimisation of the resource cycle of passenger vehicles - a technological framework. The role of particle size reduction, liberation and product design in recycling passenger vehicles. Recycling experiments - from theory to practice.IV. Metallurgical Recycling of Aluminium. Aluminium metallurgy and recycling raw materials. Physical separation of aluminium containing material. Recycling of aluminium metal containing material. Simulating a rotary furnace for aluminium recycling. A. Relevant theory. B. Description of metal production flowcharts. C. Car recycling - a case study. D. Excel screen captures depicting the optimization model. This book is a must for individuals and companies that have an interest in developing sustainable technology and systems in the complex 'Web of Metals' on a first principles, technological and economic basis, with a focus to the minerals, metals and product manufacturing industries. 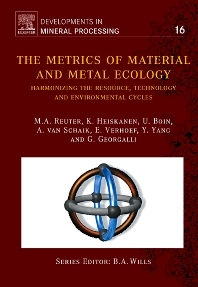 In this inter-, intra- and trans-disciplinary book the material/metal cycle will be central, addressing technology as the basis for achieving sustainability within the system of primary mineral and metal producing, and the consumer product material cycles, linked to nature's cycles. The following major topics (not exclusive) are discussed in a detail, which will satisfy company CEO's and students of environment, engineering, economics, and law alike: (i) industrial ecology, (ii) system engineering concepts, (iii) development of future breakthrough technology as well optimization of present technology, (iv) process fundamentals (e.g. thermodynamics, separation physics, transport processes etc. ), (v) product manufacture and design (for recycling), (vi) environmental legislation and (vii) technology as a basis for achieving sustainability within our present society. The book discusses contentious issues such as the limits of recycling determined by physics, chemistry, economics and process technology, therefore providing the reader with a fundamental basis to understand and critically discuss the validity of environmental legislation. Furthermore, the 'Web of Metals' (i.e. the dynamic interconnection of metal and material cycles and product systems) will reveal that, if the application of environmental evaluation techniques such as material flow analysis, life cycle assessment etc. are not carried out on a sufficient theoretical basis, technological and economic understanding, analyses could lead to erroneous and in the end environmentally harmful conclusions. The book is illustrated with many industrial examples embracing car and electronic consumer goods manufacturing and recycling, and the production and recycling of all major metals (e.g. steel, aluminium, copper, zinc, lead, magnesium, PGM's and PM's) and to an extent plastics. A complete section of the book is devoted to the recycling of light metals. Numerous colour figures and photos, plant and reactor data as well as software and computer models (running under Matlab's Simulink® and AMPL® as well as tools based on neural net technology (CSense™) are provided to give the reader the opportunity to investigate the various topics addressed in this book at various levels of depth and theoretical sophistication, providing a wealth of information, share-data and industrial know-how. Finally, the book philosophically discusses how to harmonize the resource, life and technological cycles depicted by the figure on the cover to make a contribution to the sustainable use of resources and products. Any discipline interested in the sustainability of materials and metals and also products i.e. engineers, business community, legislators, lawyers in the field, environmentalists, biologists, industrial ecologists, material scientists etc.